I responded to an ad on Kijij for cory catfish. She said that she has eight, at least, cory catfish (I.e. Maybe more, maybe less), some are bronze, and others are albino. I think these guys will do well in our 20 gallon long guppy tank. It has sand substrate. Just sharing the news. I do hope everything works out and I can pick them up tomorrow. I have to drive about 45 minutes to an hour to get to them. We do have a styrofoam box to put them in, hopefully that will help with the heat reduction. These cories are much bigger than the guppies. As far as I know, cories are very peaceful though. Our panda cory, Callie, is extremely peaceful! I think there is no reason to be concerned though, right? @alexmtl wrote: Actually, full of eggs. She is well conditioned and could probably spawn by the looks of it. Two weeks of conditioning with blackworms and a cool water change would trigger it. Unfortunately, there are a ton of snails in there....so, I'd have to catch her in the act and get the eggs out fast. I'll have to get something ready, just in case! A breeding net that you can hang in the flow of the filter would do for hatching the eggs. Look for eggs on the glass and under leaves when she is slimmer the next morning. @Shell wrote: Maybe more babies? Yay! There will be a flurry of activity. The males with be very active surrounding the female(s). The female will swim around the tank searching for suitable egg deposit spots. The males will place the spawn into the mouth of the female and she will "mouth" the egg as she places it. Spawning takes a few hours, usually in the morning as rain "cool water" and dark to low light initiate the behaviour. That has been my experience in the past. Awesome healthy corys you have there. And corys are long lived too. I have had my school of paleatus for years. And I have a relative who had some aeneus corys for 10 years. Thanks everyone! I will keep my eye out for breeding behaviour. As for the mop, will I just make that with yarn? I have never made one before, and I have never seen them in shops. @Shell wrote: I responded to an ad on Kijij for cory catfish. She said that she has eight, at least, cory catfish (I.e. Maybe more, maybe less), some are bronze, and others are albino. I think these guys will do well in our 20 gallon long guppy tank. It has sand substrate. Just sharing the news. I do hope everything works out and I can pick them up tomorrow. I have to drive about 45 minutes to an hour to get to them. We do have a styrofoam box to put them in, hopefully that will help with the heat reduction. love that you id this!!!! I too am happy that I made this decision, hubby was not home, he was away on training, and so I acted on my own. Keep your fingers crossed that all works out for all 13 fish! 5 of which were not expected! Yes, just use yarn. Google it and you will find how to do it. It is very easy. Well, I picked up yarn last night and the plan was to make the mop today and put it in after the water change....too late! 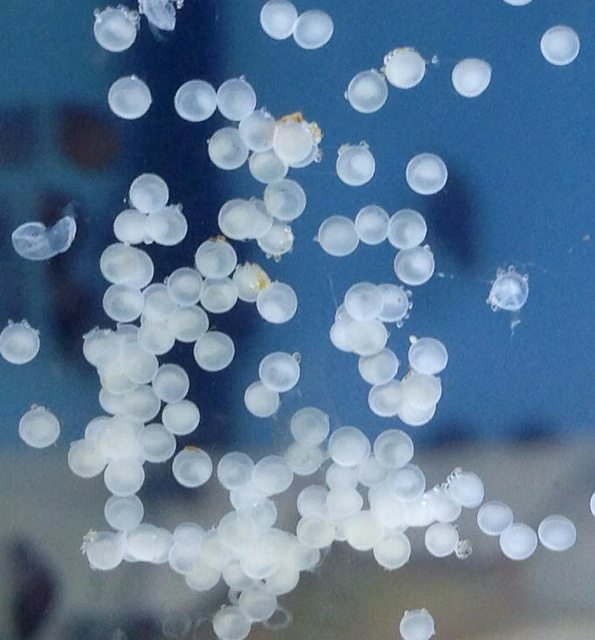 Got up this morning and they were going crazy attaching eggs - now the tank glass is covered in eggs! 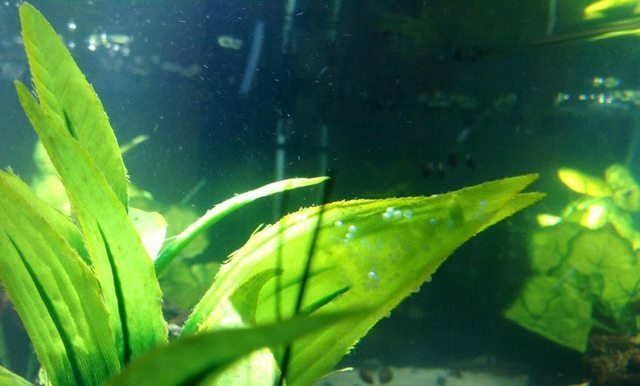 Unfortunately, I know the snails will eat them, so I'm pretty sad I was able to scrape a few off of the glass and I put them on a moss ball, poked a string through it, and then hung the moss ball under the filter outflow - maybe I'll save a few...but I was pretty shaky doing this, and so it likely will not work! I also cut off a leaf from one of the plants that had a few eggs attached, hung it in the same place. 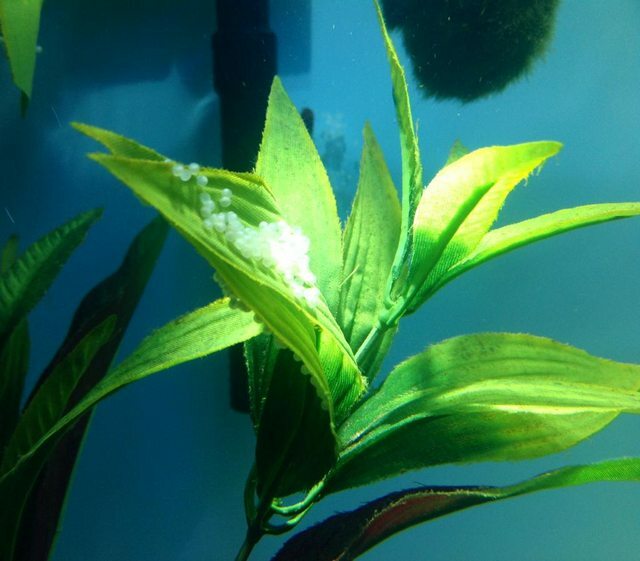 The eggs look pretty white, as you can see in the pic, does this mean that they are not fertilized, or does it take time for them to darken up? Wow, that is a good bunch of eggs! If you have a breeder net or similar and hang it under the filter outflow you will have more success as no other fish/snails can reach the eggs that way. I put some antifungus meds into the container that I put the eggs into. I gave the eggs are few days to see which ones fungused and which kept developing. Like you I used a razor blade to scrape off the eggs. You may want to put the cories into a large tupperware container, with long runs to have them continue their breeding, and then you can take them out when they are done. Good job and good luck !!! That is only one bunch of eggs in the pic - there are at least 6 other bunches like that and they are still laying eggs! I just took a video of Big Momma laying eggs....will post it as soon as I upload it! Today is WC day...should we hold off on changing their water? @Shell wrote: Today is WC day...should we hold off on changing their water? Like I said, the female was "ripe"
@alexmtl wrote: Like I said, the female was "ripe"
Yup - you sure called it!!!!!!! I wish we were more prepared for this - I've been searching for a decent container to put a leaf or two in with a bubbler....also had to look for some tubing. I have the betta box that Belle was living in before we took her in - might try that. I do hope they lay more eggs in the future so I can get this mop made and have a better plan!! and nerve wrecking at the same time! @goldfishbetalover wrote: and nerve wrecking at the same time! Nerve-wrecking is right! I have been pulling snails off of leaves ever since she laid the eggs!! 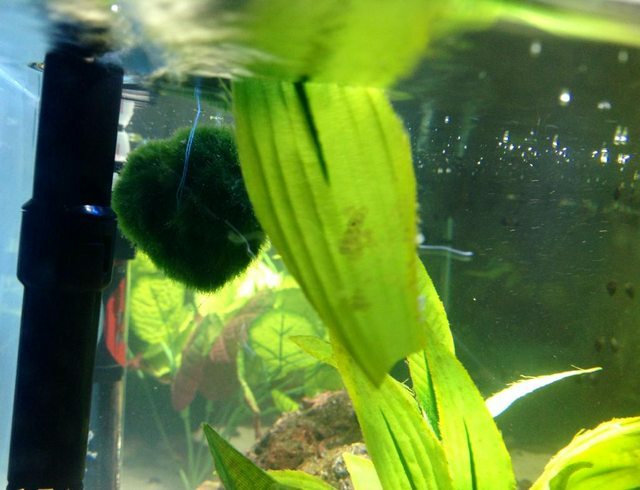 At least the snails can't get to the leaf and moss ball hanging from the filter! None "appear" to have any fungus, but then again, I can't be certain. Any thoughts on the differences in appearance of these eggs? If you see a darker spot in them, they are definitively fertile as that is the embryo that is developing. If you take a close look you should be able to see a small line (at the limit of the egg) curled, which is the body/tail. @Biulu wrote: If you see a darker spot in them, they are definitively fertile as that is the embryo that is developing. If you take a close look you should be able to see a small line (at the limit of the egg) curled, which is the body/tail. Thanks Biulu! Unfortunately, only a few seem to have the dark spot - the majority appear to be solid white. I just took a peak and I am unable to see a small line in any....maybe I'm just missing it. Sigh - maybe these eggs will not turn into cute little babies...just gotta wait and see, I suppose! I have read online that the time-frame is about 3-5 days. I assume if nothing has happened by then, I should remove them? If they don't hatch put them in the tank for the fish to eat. It is a good protein source. @Biulu wrote: If they don't hatch put them in the tank for the fish to eat. It is a good protein source. incredible to see these photos for sure! I really hope you end up with some fry Shell. Such a cool journey. Good luck!